Over the thirteen-month period from March of last year through April 20th of this year, a Twitter search returns a total of four–four!–instances of the phrase “Easter worshippers” being tweeted by users across the platform’s hundreds of millions of users and the billions and billions of tweets they produced. All four of the accounts are small, unverified ones–none even cross the four-digit follower threshold. The mask is slipping. This has to be a simulation. I must be in a simulation. I AM IN A SIMULATION! Do I have to keep playing now that I’ve definitively figured it out? Who am I even talking–or typing–to, anyway? Go ahead, generate your responses, NPCs. I know the score! That works out to a public poop incident being reported every 19 minutes, day and night. The absolute rate of public defecation must be higher, probably considerably so. What percentage of people take the time to log official complaints of particular encounters rather than merely shaking their heads as they go on their way? Don’t know what you’ve got ’til it’s gone. We’ll finally collectively realize what a precious thing we’ve lost when all we see in every direction is rubble. Relative search volume correlates with Hillary Clinton’s share of the vote at a pretty robust .60, and that’s with a handful of small states–Alaska, Montana, West Virginia, Wyoming, Idaho, both Dakotas (states that gave little support to Clinton), and Hawaii (which gave her plenty of support but hardly on account of white liberals)–excluded from the regression on account of not registering at all because of lack of search volume interest. Parenthetically, the spike in 2014 appears to coincide with something called the “Whiteness Project“, a two-part series produced for PBS and directed by Whitney Dow. It looks interesting. Watching the trailer, it’s hard to believe this was something commissioned by PBS just five years ago. Those seem like the halcyon days of candor by comparison. Many of these takes would today be portrayed in the media as flirting with white supremacy, and giving them a platform–even if the ultimate purpose was to discredit–of questionable utility at best. There is a revolving interactive module containing quotes from project participants in their teens and twenties. One young man says, “I have to hide who I am”. Another, “I feel more comfortable around people of my race”. Still another, “I don’t feel guilty”. The next, “I don’t feel personally responsible for racism”. And the one that really sets off alarm bells, “Being white definitely has value to me”. There are a handful of responses that trend in a direction that will make PBS audiences more comfortable, like “I would be in jail if I was not white” (if physiognomy is real, he looks like he could be telling the truth!) and “there is so much privilege I have”, but the anti-anti-white perspectives comprise a plurality. Participants’ pictures are included. It doesn’t seem inconceivable that statements like these will preclude some of those having made them from elected office in the future. Following is a quick walkthrough of how to use the General Social Survey without the aid of any outside statistical packages. Now either hit enter on your keyboard or click the “Run the Table” button below the data entry field box. The new page that opens contains our results. On the left (the row), running from top to bottom, we have respondent wordsum scores. 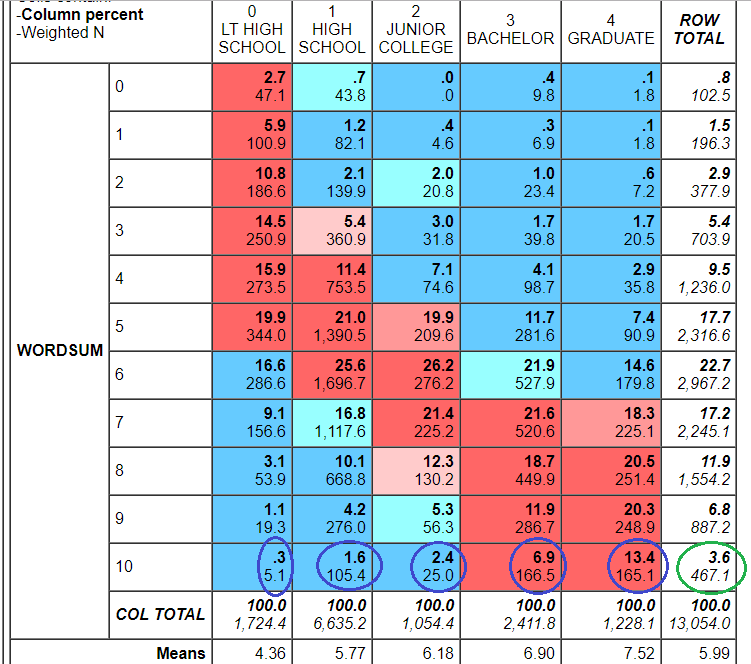 Along the top (the column), running from left to right, we have the highest educational degree respondents have earned. Let’s focus on a wordsum score of 10. We see that .3% of respondents with less than a high school education scored a 10 on the wordsum test, while 13.4% of those with a graduate degree did. The green circle shows what percentage (3.6%) of the entire respondent pool scored a 10. 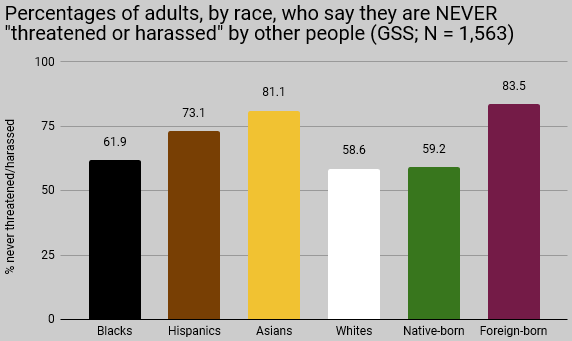 The non-bolded numbers below each of the bolded numbers–the bolded numbers actually show percentages–reveal the weighted number of actual respondents who fall into each cell. 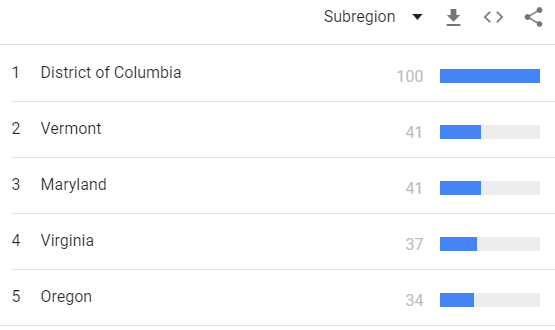 So 5.1 respondents with less than a high school education scores a 10. How do 5.1 people do something? They don’t, unless the results are adjusted to correct for under-/over-sampling as they are in this case! 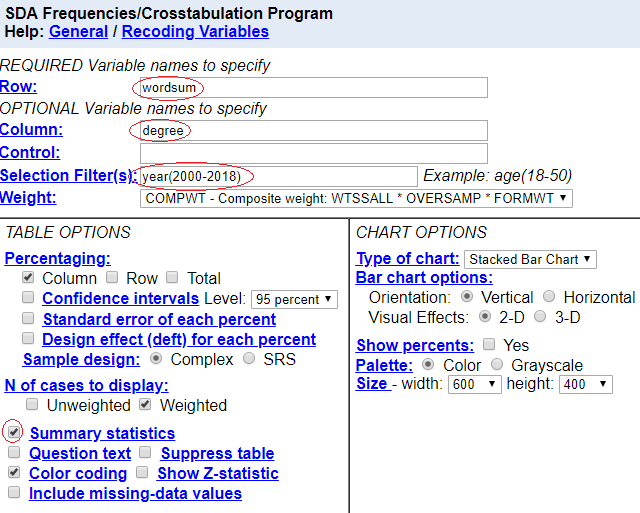 Just above the “Summary statistics” box we checked, notice two boxes under the “N of cases to display:” hyperlink. 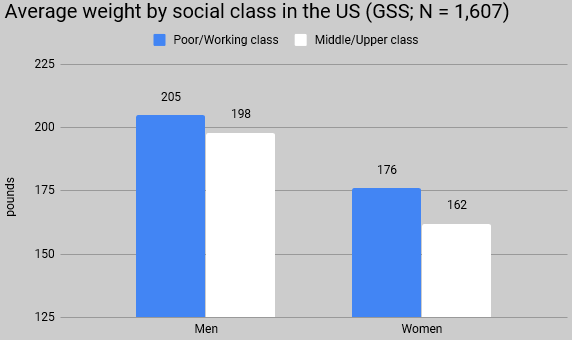 The GSS will default to weighted responses, but that can be toggled to unweighted responses if preferred. A bit further down shows the average (mean) wordsum scores among respondents by degree attained. Respondents with less than a high school education earned an average score of 4.36 on the wordsum test. Respondents with a graduate degree averaged a 7.52. The average for all respondents was 5.99. One standard deviation in wordsum score for the entire respondent pool is 2.00. There is thus a 1.58 standard deviation difference (7.52 – 4.36 = 3.16; 3.16 / 2.00 = 1.58) between the average high school dropout and the average graduate degree holder in wordsum performance. Return to the home page where we initially entered our variables. How do we find them in the first place? The “Search:” field (green circle) functions as a sort of search engine for variables. If we are looking for questions on religion, for example, we can type “belief” into the field and either hit enter or click the view button. Or at least we should be able to, but for some reason this function does not work in the 2018 iteration of the survey at the time of this writing. However, for all variables except for those added for the first time in 2018, we can go to the 2016 page and find variables this way (notice the link now ends in +gss16 instead of +gss18). This page looks nearly identical. Let’s type “belief” into the search field and then hit enter or press the “Go” button. Returned to us are several variables that have something to do with “belief” in them. 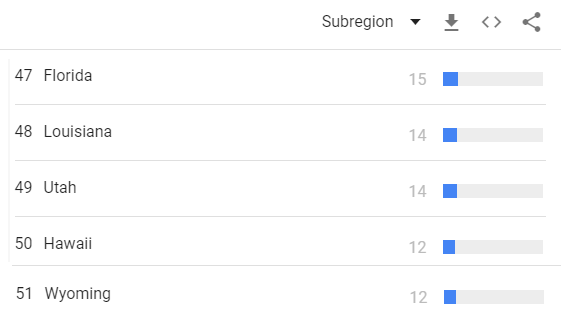 We can then go back to the homepage and enter those specific variables into the “Row:” and “Column:” fields to discover how they cross-tabulate with other variables like we did early with wordsum and degree. Returning to the “Variable Selection:” section, we can type specific variables–they must be verbatim–into the “Selected:” box (red circle). Let’s type the variable “hell” into the selected box and push the “View” button. 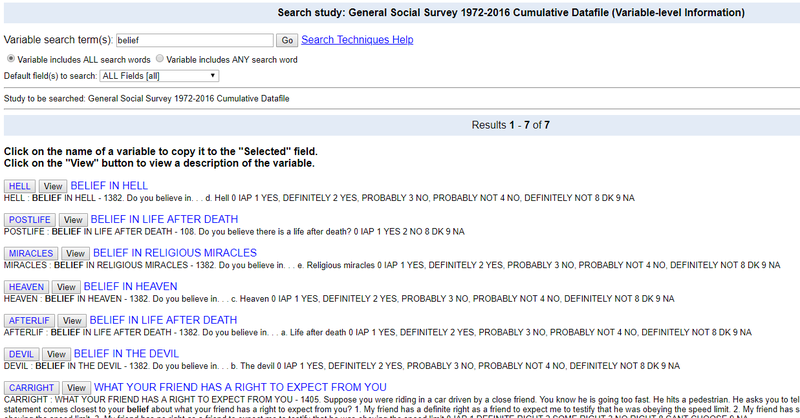 This shows us the question presented to respondents (“Do you believe in … d. Hell”?) and the distribution of all responses through all years the question has been asked. Parenthetically, questions are often asked as part of modules, so each item in the module will have a letter in front of it. 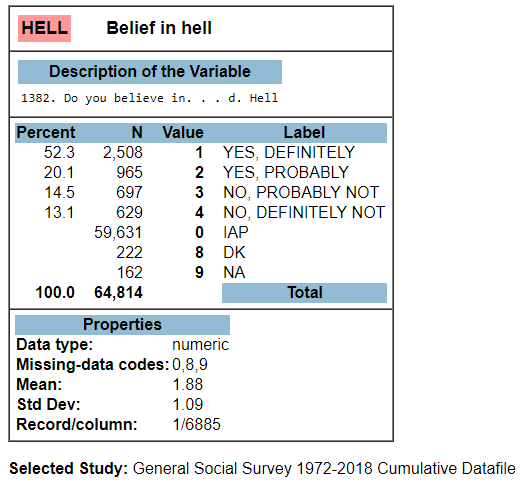 This module presumably asked respondents whether they believed in a host of different things of which Hell was one. 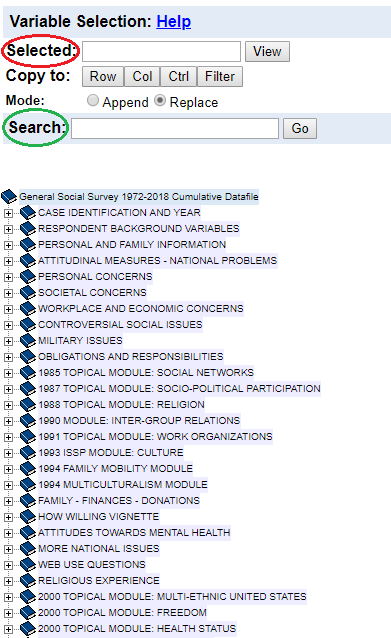 There is also a drill down database below the “Selected:” and “Search:” fields that can be used to look through the entire field of variables since the survey’s inception in 1972. I think that’s enough to get started playing around with the survey if you’re so inclined. Enjoy! 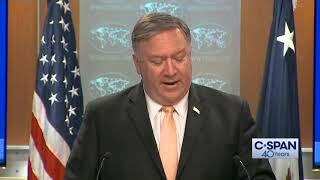 Our imperial overlords appear to be far more interested in it than middle Americans are. We should expect a white kid from some loserville in say, Wyoming, to be the one looking for a portal into the world of white supremacy, shouldn’t we? What is the zeitgeist like in Hawaii? 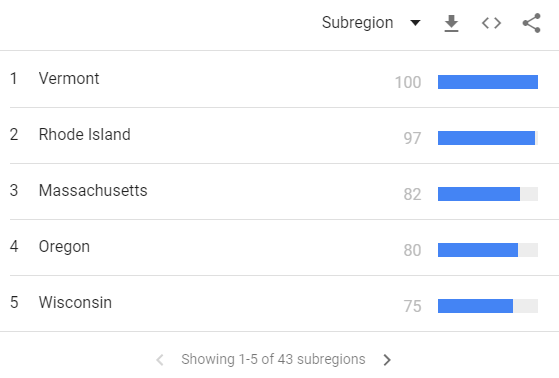 As I understand it there has long been an undercurrent of resentment towards white colonizers (ie “kill Haole day“), but it is not ubiquitous and race relations are relatively good on the islands given the demographic composition of the population. Parenthetically, I was trying to figure out why the second-most related search topic, after “New Zealand”, was the Eric Clapton song “Layla”. The concept of Original Sin is alive and well in the current year. A white supremacist, defined by Merriam’s as “a person who believes that the white race is inherently superior to other races and that white people should have control over people of other races”. A white nationalist, defined as “one of a group of militant whites who espouse white supremacy and advocate enforced racial segregation”. Parenthetically, given this definition Facebook’s ban on advocating white nationalism along with its pre-existing ban on advocating white supremacy is consistent. A fascist, fascism being defined as “a political philosophy, movement, or regime (such as that of the Fascisti) that exalts nation and often race above the individual and that stands for a centralized autocratic government headed by a dictatorial leader, severe economic and social regimentation, and forcible suppression of opposition”. An empiricist, empiricism being defined as “the practice of relying on observation and experiment especially in the natural sciences”. A free speech near-absolutist. If a perspective does not advocate illegality and is not dehumanizing, it should be given a hearing. If it is not given a hearing, its proponents will often find another way of expressing it. Life is not a video game*. Violence is not golden. War is not glorious, war is hell. I fully support all efforts to avoid violence. Sheath the “s”–I want words, not swords. Engagement does not indicate endorsement, it indicates an open and critical mind. This pertains to both what I write and to the comments others post here. As I’ve gotten older, it has become increasingly clear to me that my comprehension of the amount I don’t know grows incessantly faster than things I am certain that I do know. I personally withdraw any and all previous assertions made here over the years that do not rest on sound empirical foundations even though all that has been written since the blog’s inception in 2005 remains at the Unz Review as content I do not have ownership of. Also, while I’ve voluntarily handed out literature and talked to people about various political campaigns, I’ve never been an official part of any political campaign nor have I ever received payments of any kind for helping any political campaign. As I am not a public figure in the legal definition of the term, any media portrayals contrary to what has been outlined above are to be considered legal grounds for libel and/or slander against a private person. We could all stand to learn a thing or two from Nick Sandmann. * If simulations are possible, we are almost certainly in one, because if they are possible then there should effectively be an infinite number of simulations–and simulations within simulations–underway at any given time. Thus the chance that our existence is the single exception in an endless sea of simulations is infinitesimally small. But even if we are in a simulation, no one has convincingly broken through the fourth dimension to prove that it is so and thus no one should act as though he is in a simulation. An absolute immigration moratorium and reparations for American blacks and American Indians who are verifiably able to prove they are at least third-generation in residency, with a sunset provision that takes effect in twenty years if and only if the official poverty rate is under 10.0%. The annual reparation amount per eligible adult is $1,000 a month, indexed to the CPI over the twenty-year period, an amount that comes to more than half the contemporary difference in median incomes between white and black/American Indian households. With around 30 million people eligible, this comes to $360 billion annually–less than 10% of the current federal budget. Could a Republican win on this? It seems conceivable to me. 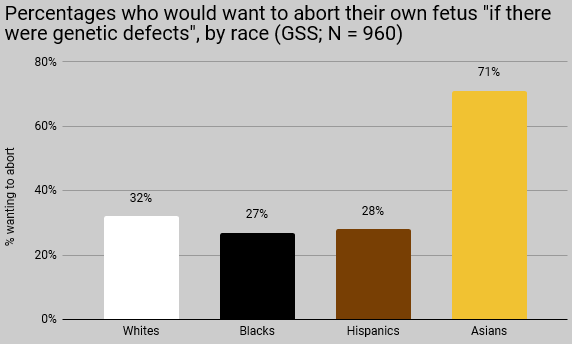 It takes the leading issue of concern for the Republican electorate and pairs it with a real benefit for the rest of Old America that would generate a lot of vociferous support from American blacks, making it exceedingly difficult for the left to attack. GINA notwithstanding, the concept is going to need to be seriously contended with soon. A phrase like “white privilege”, even after accounting for the politically-loaded baggage it carries with it, is a blunt and imprecise way of understanding much of anything at an individual level. Malia Obama clearly has a lot more privilege than a child born to an unmarried drug-addict holed up in some forgotten town in Appalachia does. 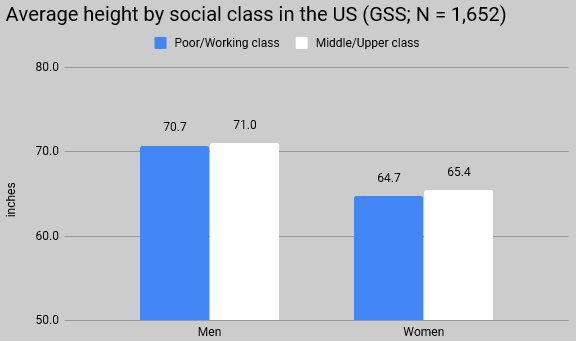 As GWAS results are funneled to CRISPR 5.0 for utilization, the genetic profiles of Malia and Cletus will conceivably make clear what a term like “white privilege” obfuscates. It may even reveal the latter to be a weapon of the elites used to hold down proles. My prediction: The coming genetic revolution will not be socialism’s undoing. To the contrary, it will be socialism’s real renaissance. Is it surprising that the first CRISPR baby came out of the East? As the center of the world reorients (heh) away from the Occident and back towards the Orient, the ethical hangups about what is derisively referred to as eugenics will increasingly become a sideshow curiosity on the global stage, much like Brunei’s gayless treatment of gays is today. On the other hand, with some Islamic exceptions, Asian fertility is the lowest in the world. When it comes to making babies, the perfect very conceivably can be the enemy of the good. 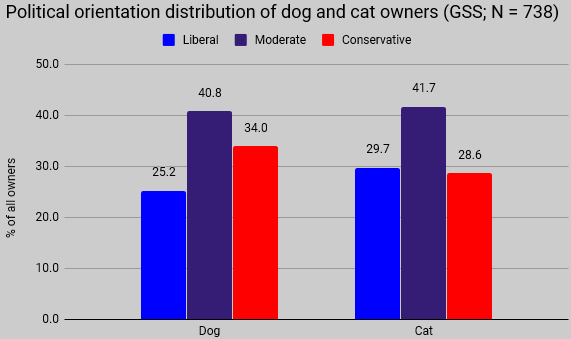 Dog owners are about 35% more likely to be conservative than to be liberal, while cat owners are marginally more likely to be liberal than to be conservative. Another stereotype empirically validated. For those who do not want to continue to freely create content for monetization by corporations who despise them, get off social media. For those nefarious types who want to throw sandbergs in the gears of Facebook’s efforts to stamp out hate, replacing “white” with “Israeli” is a place to start. The phrase “Israeli nationalism” is very infrequently used in the US, so the substitution won’t disrupt conversational flow once adopted. Instead of “whites deserve their own homeland” write “Israelis deserve their own homeland”, instead of “whites are under attack” write “Israelis are under attack”, etc. Eagerly anticipate Facebook coming under leftist pressure to address the change and subsequently tweaking its algorithm to block the aforementioned Israeli phrases–would they dare?–and sending users attempting to input them to a mental rehabilitation site. Watch the coalition of the marginalized twist itself into a pretzel trying to wrestle with the fallout of Muslims and black nationalists cheering the additional ban while Ben and Bari become apoplectic. The black nationalist movement is a reaction to centuries of institutionalized white supremacy in America. Black nationalists believe the answer to white racism is to form separate institutions — or even a separate nation — for black people. 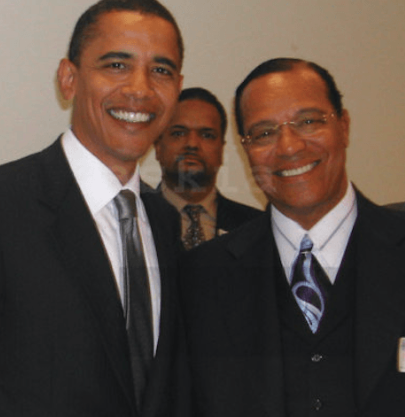 Most forms of black nationalism are strongly anti-white and anti-Semitic. Existing black nationalist groups have grown in size and new groups have formed. This growth is a response to the current climate of racial divisiveness, specifically police violence and Donald Trump’s derisive remarks about African Americans, including journalists and NFL players, and majority-black countries. 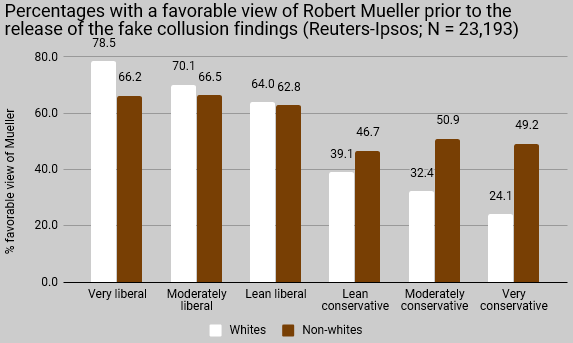 Unlike white hate groups, they have made virtually no inroads into the mainstream political realm and have virtually no supporters among elected officials. Indeed. Senator Patrick Little and congressman Paul Nehlen practically own the Capitol Building. The closest someone like Keith Ellison could get to a position of power, in contrast, is as busboy at a swanky DC restaurant. Looking at it for the first time, I expected the center’s censure to be exclusively attributed to black nationalism’s animus towards Jews, but it does make note of “anti-white” sentiment. Black nationalism’s alleged hatred for whites is described as a “predictable reaction to white supremacy” while its reported antipathy towards Jews isn’t quasi-rationalized in a similar manner. Explicitly hating whites, while at some level understandable, is poor form. Negative feelings towards Jews are however entirely unprovoked manifestations of concentrated evil. Just as Romney won the challenging party’s nomination after placing second in the election that gave Obama his first term, Sanders wins the 2020 nomination. Putatively on account of unforced errors and missed opportunities, Sanders loses an election that was his to win just as Romney did in 2012. Trump’s second term is then as hard-edged relative to his first as Obama’s second was to his first. Trump gets fed up with Jarvanka for the last time. He tells Ivanka that it’s time for her to get out of the White House and work directly on women’s entrepreneurship in Africa or whatever nice liberal white lady cause she wants. Then Jared goes with her to head those programs. At which point, Trump appoints someone like Kris Kobach to get the Wall built, Trump ekes out a win in 2020, and since Junior and Kobach built the Wall, got e-verify, did mass deportations, etc., it no longer matters what the old man does, even if it means Israel annexing Syria or whatever. The GSS finally got woke in 2018, asking respondents for the first time if they were transgendered or some other gender other than male or female. Of the whopping three who identified as such, two were asked how many days of poor mental health–defined as “stress, depression, and problems with emotions”–they’d experienced over the previous 30 days. 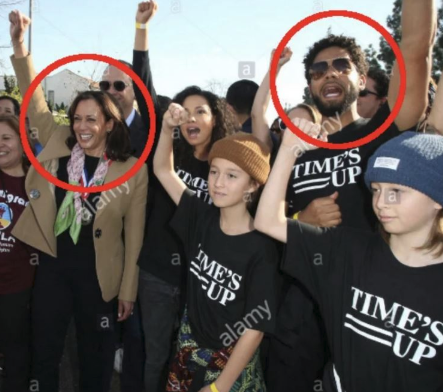 Both reported having experienced it all 30 of the last 30 days. Fewer than 4% of cisgendered respondents reported experiencing that high a level of poor mental health over the same time period. A sample size of two obviously lacks statistical significance, but I doubt many readers will find this result particularly surprising. Has society thought about the potential consequences of encouraging children to express and explore inchoate feelings of transgenderism? It should, long and hard. 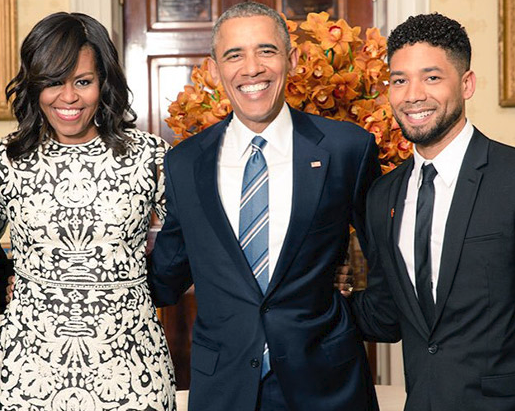 A potential takeaway from the Smollett hoax: Black, Jewish, Gay, and Elite privileges > White privilege. We scoff when Conservative, Inc says the right shouldn’t do identity politics like the left does because principles. The same self-defeating argument can be made about not playing the victim card like the left does, again because principles. Well, sometimes Interests > Principles. One of the major reasons Trump won the Republican nomination and ultimately the presidency is because he has never had any qualms about portraying himself as a victim. There is a time to weaponize anti-whiteness because sometimes the best defense is a good offense. Parenthetically, Clinton beat Trump 71%-26% among voters who were born outside of the US. But immigration has nothing–NOTHING!–to do with political power. They aren’t ringers, they’re dreamers. Dreamers! Got that, bigot?